An undergrad’s tiny place beats dorm living by a mile. The jumping off point for the living room was the sofa that designer Steven Santosuosso found at Reside in Cambridge. “It’s upholstered in a complex fabric of grays, browns, and beiges that from far away looks like sand,” he says. When Isabella Soto relocated to Boston for school, she brought no furniture, posters, or decorative knickknacks. Then a busy college student with an interest in fashion and a sophisticated sense of style, she didn’t have time to outfit her 800-square-foot apartment in Downtown Crossing. So she reached out to Homepolish.com, a rapidly growing New York City startup that eschews the traditional interior design model, skipping the commissions and product markups and charging a flat hourly fee. Clients sign up online and get paired with a nearby designer. Soto was assigned to Steven Santosuosso, who runs Squarehouse Studios, a design firm based in Somerville. “Since she didn’t have any furnishings, the project was a total blank slate,” Santosuosso says. “I’m a very relaxed person; I’m into boho chic and neutral colors,” says Soto. She had lived in Florida for years and spent time in Greece, so coastal style has special meaning to her. Santosuosso chose furnishings in sand-colored hues and added pops of blue to suggest the ocean. While Soto’s not fond of patterns or bright colors, she likes shiny pieces, so Santosuosso incorporated a number of mirrored surfaces, which have the added benefit of making the space feel larger. Furniture has clean lines and an understated contemporary feel while various framed vintage fashion prints infuse a sense of nostalgia. Brass and gold accents manage to feel both retro and modern. Craigslist and sized the artwork to suit them. He laid the pieces on the floor, using the width of the bed as a starting point, and began moving pieces to decide on a layout. “You can just sort of fiddle around with the frames and figure out what will work best,” he says. 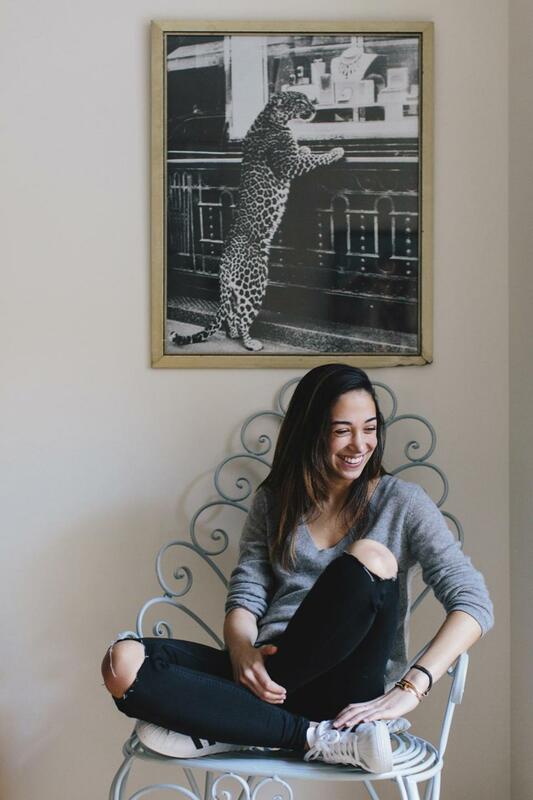 While a busy college student, Isabella Soto hired a designer through a startup called Homepolish, for an hourly fee. 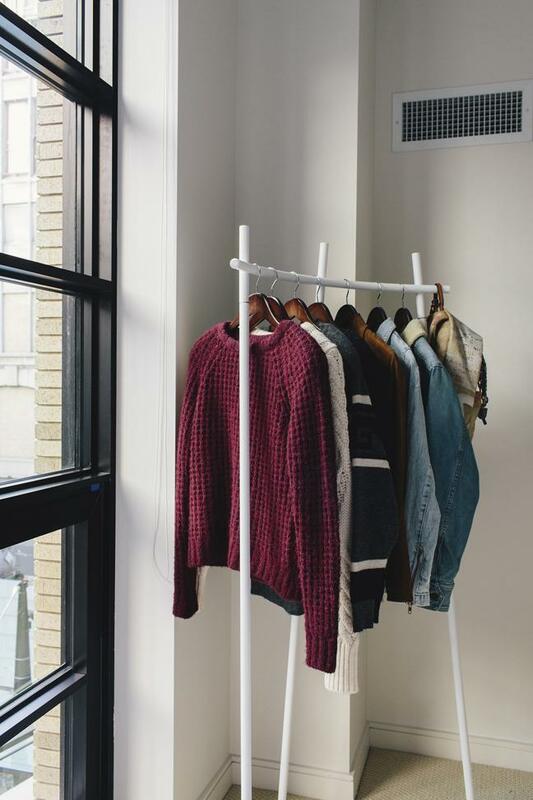 Closet space is minimal, so Santosuosso found a free-standing garment rack to expand Soto’s options. She loves it. “It’s where I keep my best sweaters,” she says. Hammered metal night stands flank the upholstered West Elm bed trimmed with nailheads. 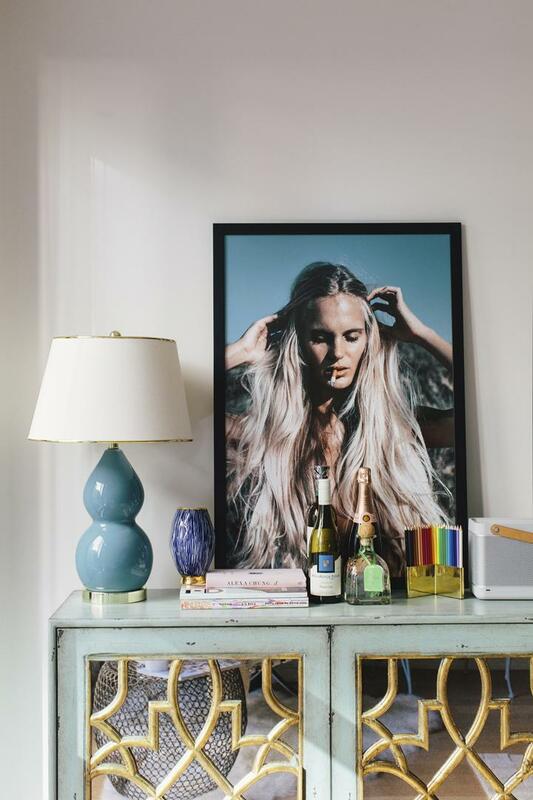 Soto stores glasses and wine in the teal-hued cabinet from Z Gallerie. 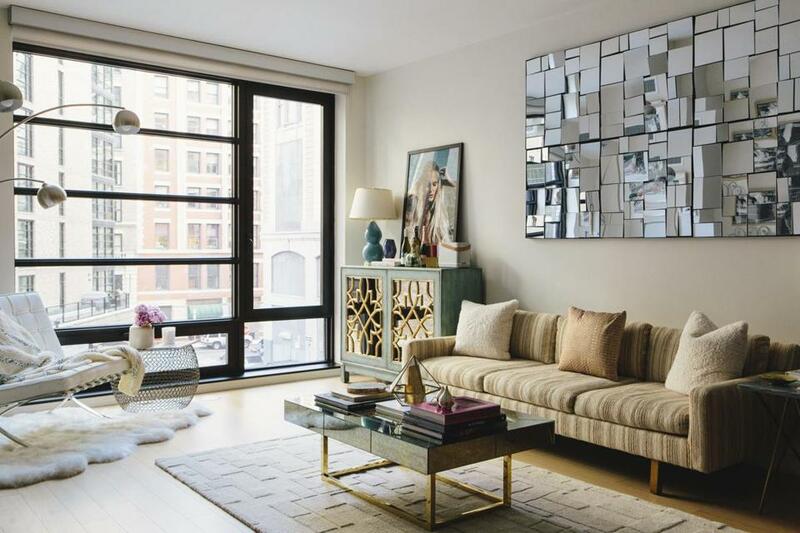 Topped by a vintage fashion photo, the piece’s gold accents and mirrored doors exude a youthful vibe.